Looking for a high-quality, super dependable vacuum for commercial cleaning? Check out the Royal All-Metal 14" Upright Vacuum! The all-metal construction makes this unit exceptionally durable. Unlike other vacuums that use plastic-like materials that can crack and break, the Royal All-Metal Upright Vacuum won't fall apart even after heavy use and abuse. Featuring a bell-shaped nozzle and a curved, double row ball bearing revolving quad brush roll with stiffener, this unit provides exceptional fiber agitation to pick up all that deep down dirt and dust that other vacuums leave behind. This model offers a 10-amp motor, 9-blade metal fan, and 14" cleaning path, making it perfect for commercial cleaning tasks in offices, hotels, retail facilities, and more. This unit offers 5-position carpet height adjustment, so whether you're cleaning short-nap fibers or tall, shaggy carpet, you can adjust the vacuum to the appropriate height for best vacuuming results. At 22 lbs, this unit is a bit heavier than other models, but moving it around your work area is easy. All the weight is in the base of the unit. The handle is very lightweight and the entire unit rolls effortlessly around on commercial-quality urethane wheels. Dirt, dust, and debris are captured in Type B bags (standard or HEPA available). 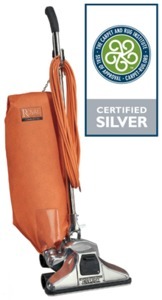 The Royal All-Metal Upright Vacuum features a standard top-fill orange zipper bag. Royal Vacuum Cleaner-Type B-Bags-Paper-MP-R066247-EA-NOT HEPA! !